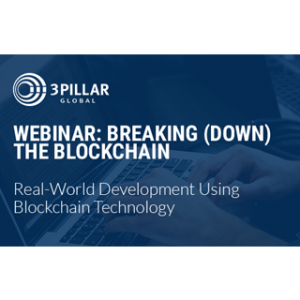 Recently, 3Pillar’s Adi Chikara and Michael Lisse gave a webinar on real-world development using blockchain technology. The webinar serves as a primer on blockchain, providing information on how blockchain is fueling innovation in the Financial Services Space, as well as how companies can get started using blockchain for themselves. The webinar provides a succinct introduction to blockchain as a new technology, including how it will impact the financial services world and pitfalls to avoid when exploring it. Adi and Michael also take the technology a step further with the Blockchain Canvas, which is based on Strategyzer’s business model canvas and helps businesses to identify areas in which they can begin deploying blockchain. Adi Chikara is a Technology Strategist for 3Pillar’s Solutions Management Team and he recently presented the Blockchain Canvas at the DEVCON1 Ethereum Developers conference in London. Michael Lisse is 3Pillar’s Global Lead of Strategic Business Development and Client Executive for Financial Services. He and Adi recently sat down with CoinJournal to discuss blockchain, including the Blockchain Canvas and what the future holds for the technology.